EFFECT: A very unusual time reversal illusion. A six-foot high wooden frame shaped like an hour glass with steel spikes going through the frame is shown to the audience. The performer says he will try to reverse time. He cuts a rope in two and has it marked. A paper is torn in to small pieces. The performer writes the current time on a sheet of paper and places it on a table. Music is playing in the background. Performer stands behind the hourglass frame and pulls a cloth up in front of him. Suddenly the music starts playing in REVERSE! The performer lowers the cloth and is now seen to be in front of the frame work. He says a few minutes earlier he was in front of frame as he is now because time has reversed. Somehow the performer is now in front of the frame work as he was a few minutes earlier. The cut rope is now in one piece. The torn paper is back together. The paper he wrote on is NOW BLANK as time has reversed back before he wrote on it! 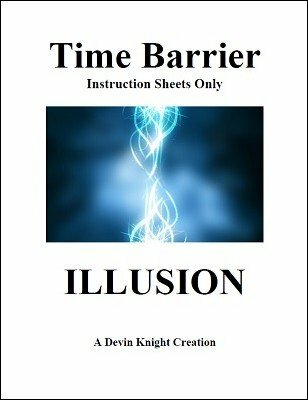 The time reversal routine can be used with any walk through penetration you may own such as walking through a mirror or sheet of steel. This routine even works with the walking through a rope.